David Ben-Gurion (Hebrew: דָּוִד בֶּן-גּוּרִיּוֹן‎‎; pronounced [daˈvɪd ben gurˈjo:n], born David Grün; 16 October 1886 – 1 December 1973) was the primary founder of the State of Israel and the first Prime Minister of Israel. 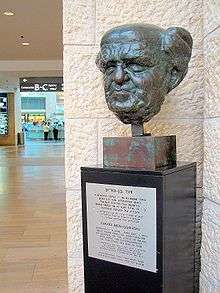 Following the war, Ben-Gurion served as Israel's first Prime Minister and Minister of Defense. As Prime Minister, he helped build the state institutions, presiding over various national projects aimed at the development of the country. He also oversaw the absorption of vast numbers of Jews from all over the world. A centerpiece of his foreign policy was improving relationships with the West Germans. He worked very well with Konrad Adenauer's government in Bonn, and West Germany provided large sums (in the Reparations Agreement between Israel and West Germany) in compensation for Nazi Germany's persecution of the Jews during the Holocaust. David Ben-Gurion Square—site of the no longer existing house where he was born, Płońsk, Wspólna Street. 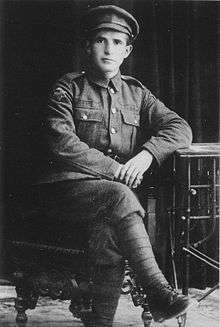 In 1909 he volunteered with HaShomer, a force of volunteers who helped guard isolated Jewish agricultural communities. On 7 November 1911, Ben-Gurion arrived in Thessaloniki in order to learn Turkish for his law studies. The city, which had a large Jewish community, impressed Ben-Gurion, who called it "a Jewish city that has no equal in the world". He also realized there that "the Jews were capable of all types of work" Some of the city's Jews were rich businessmen and professors, while others were merchants, craftsmen and porters. In 1912, he moved to Constantinople, the Ottoman capital, to study law at Istanbul University together with Yitzhak Ben-Zvi, and adopted the Hebrew name Ben-Gurion, after the medieval historian Joseph ben Gorion. He also worked as a journalist. Ben-Gurion saw the future as dependent on the Ottoman regime. Settling in New York City in 1915, he met Russian-born Paula Munweis. They were married in 1917. 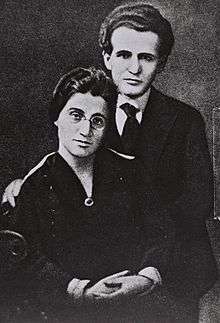 David and Paula Ben-Gurion had three children: a son, Amos, and two daughters, Geula Ben-Eliezer and Renana Leshem. Amos Ben-Gurion would become Deputy Inspector-General of the Israel Police, and also the director-general of a textile factory. He married Mary Callow, an Irishwoman who had converted to Judaism. Amos and Mary Ben-Gurion had two daughters and a son, and six granddaughters. Geula had two sons and a daughter, and Renana, who worked as a microbiologist at the Israel Institute for Biological Research, had a son. His Ben-Gurion House, where he lived from 1931 on, and for part of each year after 1953, is now a historic house museum in Tel Aviv. In 1946, Ben-Gurion and North Vietnam's Politburo chairman Ho Chi Minh became very friendly when they stayed at the same hotel in Paris. Ho Chi Minh offered Ben Gurion a Jewish home-in-exile in Vietnam. Ben-Gurion declined, telling Ho Chi Minh: "I am certain we shall be able to establish a Jewish Government in Palestine." In Ben Gurion: A Political Life by Shimon Peres and David Landau, Peres recalls his first meeting with Ben-Gurion as a young activist in the No'ar Ha'Oved youth movement. Ben-Gurion gave him a lift, and out of the blue told him why he preferred Lenin to Trotsky: "Lenin was Trotsky’s inferior in terms of intellect", but Lenin, unlike Trotsky, "was decisive". When confronted with a dilemma, Trotsky would do what Ben-Gurion despised about the old-style diaspora Jews: he manoeuvred; as opposed to Lenin, who would cut the Gordian knot, accepting losses while focusing on the essentials. In Peres' opinion, the essence of Ben-Gurion's life work were "the decisions he made at critical junctures in Israel’s history", and none was as important as the acceptance of the 1947 partition plan, a painful compromise which gave the emerging Jewish state little more than a fighting chance, but which, according to Peres, enabled the establishment of the State of Israel. Due to the Jewish insurgency in Palestine, bad publicity over the restriction of Jewish immigrants to Palestine, non-acceptance of a partitioned state (as suggested by the United Nations) amongst Arabs residents, and the cost of keeping 100,000 troops in Palestine the British Government referred the matter to the United Nations. The British were against the partition plan and announced they would hand the Mandate over to the U.N. on May 15, 1948. However, on May 14th the Israeli Declaration of Independence was unilaterally declared, leading to the 1948 Palestinian exodus. There is a controversy around these events. According to Uri Bar-Joseph Ben-Gurion placed a plan that called for a limited action aimed at the conquest of Latrun, and not for an all-out offensive. According to David Tal in the cabinet meeting, Ben Gurion reacted to what he had been just told by a delegation from Jerusalem. He points out that this view he would have planned to conquest West Bank is unsubstantiated in both Ben Gurion's diary and in the Cabinet protocol. Ben Gurion was aware that world Jewry could and would only feel comfortable to throw their support behind the nascent state, if it was shrouded with religious mystique. That would include an orthodox tacit acquiescence to the entity. Therefore, in September 1947 Ben-Gurion decided to reach a status quo formal agreement with the Orthodox Agudat Yisrael party. He sent a letter to Agudat Yisrael stating that while being committed to establishing a non-theocratic state with freedom of religion, he promised that the Shabbat would be Israel's official day of rest, that in state-provided kitchens there would be access to Kosher food, that every effort would be made to provide a single jurisdiction for Jewish family affairs, and that each sector would be granted autonomy in the sphere of education, provided minimum standards regarding the curriculum be observed. To a large extent this letter (or agreement) provided the framework for religious affairs in Israel till the present day, and is often used as a benchmark regarding the arrangement of religious affairs in Israel. Modern Orthodox philosopher Yeshayahu Leibowitz considered Ben-Gurion "to have hated Judaism more than any other man he had met". Ben-Gurion refused to define himself as "secular," and he regarded himself a believer in God. In a 1970 interview, he described himself as a pantheist, and stated that "I don't know if there's an afterlife. I think there is." During an interview with the Leftist weekly Hotam two years before his death, he revealed, "I too have a deep faith in the Almighty. I believe in one God, the omnipotent Creator. My consciousness is aware of the existence of material and spirit . . . [But] I cannot understand how order reigns in nature, in the world and universe – unless there exists a superior force. This supreme Creator is beyond my comprehension . . . but it directs everything." In a letter to the writer Eliezer Steinman, he wrote "Today, more than ever, the 'religious' tend to relegate Judaism to observing dietary laws and preserving the Sabbath. This is considered religious reform. I prefer the Fifteenth Psalm, lovely are the psalms of Israel. The Shulchan Aruch is a product of our nation's life in the Exile. It was produced in the Exile, in conditions of Exile. A nation in the process of fulfilling its every task, physically and spiritually . . . must compose a 'New Shulchan'--and our nation's intellectuals are required, in my opinion, to fulfill their responsibility in this." 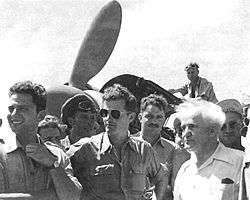 David Ben Gurion visits 101 Squadron, the "First Fighter Squadron". As head of the Jewish Agency from 1935, Ben-Gurion was de facto leader of Jewish population even before the state was declared. 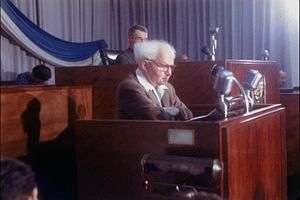 In this position, Ben-Gurion played a major role in the 1948 Arab–Israeli War When the IDF archives and others were opened in the late 1980s, scholars started to reconsider the events and the role of Ben-Gurion. 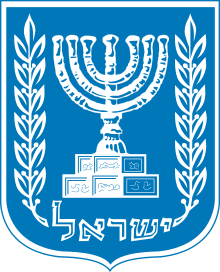 After leading Israel during the 1948 Arab–Israeli War, Ben-Gurion was elected Prime Minister of Israel when his Mapai (Labour) party won the largest number of Knesset seats in the first national election, held on 14 February 1949. He would remain in that post until 1963, except for a period of nearly two years between 1954 and 1955. As Prime Minister, he oversaw the establishment of the state's institutions. He presided over various national projects aimed at the rapid development of the country and its population: Operation Magic Carpet, the airlift of Jews from Arab countries, the construction of the National Water Carrier, rural development projects and the establishment of new towns and cities. In particular, he called for pioneering settlement in outlying areas, especially in the Negev. 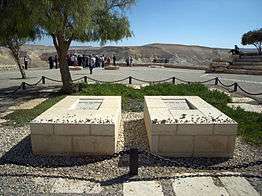 Ben-Gurion saw the struggle to make the Negev desert bloom as an area where the Jewish people could make a major contribution to humanity as a whole. He believed that the sparsely populated and barren Negev desert offered a great opportunity for the Jews to settle in Palestine with minimal obstruction of the Arab population, and set a personal example by settling in kibbutz Sde Boker at the centre of the Negev. 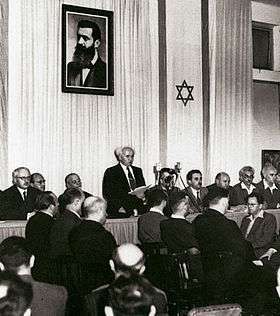 In 1949, Ben-Gurion was awarded the Solomon Bublick Prize of the Hebrew University of Jerusalem, in recognition of his contributions to the State of Israel. Ben-Gurion's Hut in Kibbutz Sde Boker which is now a visitor's center. Is also a chapter in the Pacific Coast Region of The B'nai B'rith Youth Organization in Pomona, California. 1 2 3 "Ben-gurion Reveals Suggestion of North Vietnam's Communist Leader". Jewish Telegraphic Agency. 8 November 1966. Retrieved 5 September 2015. 1 2 3 "ISRAEL WAS EVERYTHING". Nytimes.com. 21 June 1987. Retrieved 5 September 2015. ↑ Ari Shavit, Survival of the fittest : An Interview with Benny Morris, Ha'aretz Friday Magazine, January 9, 2004. ↑ Michael Prior (12 November 2012). 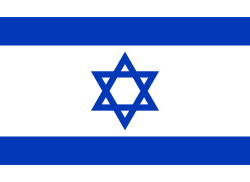 Zionism and the State of Israel: A Moral Inquiry. Routledge. pp. 293–. ISBN 978-1-134-62877-3. Retrieved 20 May 2013. ↑ Ari Shavit'Survival of the fittest,' Haaretz 8 January 2004:"The worst cases were Saliha (70–80 killed), Deir Yassin (100–110), Lod (250), Dawayima (hundreds) and perhaps Abu Shusha (70). There is no unequivocal proof of a large-scale massacre at Tantura, but war crimes were perpetrated there. At Jaffa there was a massacre about which nothing had been known until now. The same at Arab al Muwassi, in the north. About half of the acts of massacre were part of Operation Hiram [in the north, in October 1948]: at Safsaf, Saliha, Jish, Eilaboun, Arab al Muwasi, Deir al Asad, Majdal Krum, Sasa. In Operation Hiram there was a unusually high concentration of executions of people against a wall or next to a well in an orderly fashion.That can't be chance. It's a pattern. Apparently, various officers who took part in the operation understood that the expulsion order they received permitted them to do these deeds in order to encourage the population to take to the roads. The fact is that no one was punished for these acts of murder. Ben-Gurion silenced the matter. He covered up for the officers who did the massacres." ↑ "Ben Gurion Receives Bublick Award; Gives It to University As Prize for Essay on Plato" (August 10, 1949). Jewish Telegraphic Agency. www.jta.org. Retrieved 2016-07-01. ↑ Byron, Joseph (15 May 2010). "Paris Mayor inaugurates David Ben-Gurion esplanade along Seine river, rejects protests". European Jewish Press. Retrieved 10 November 2011. 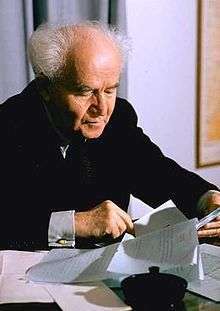 Wikimedia Commons has media related to David Ben Gurion.